You’re at the heart of your creativity. So, you probably think you’re the most important person in your career. I can already hear you saying, “Wait, what? I’m not? Well, your career wouldn’t be possible if not for the people that support you on your journey. I’m talking about the people that interact with you on social media, leave comments on your blog, join your email list, buy your products and more. You can’t take these people for granted. Today, customer expectations are higher than ever. And, it’s entirely too easy to leave a bad taste in people’s mouths when you consistently underdeliver. Now, I’m not saying you won’t make mistakes, but your reputation is something that must be protected. 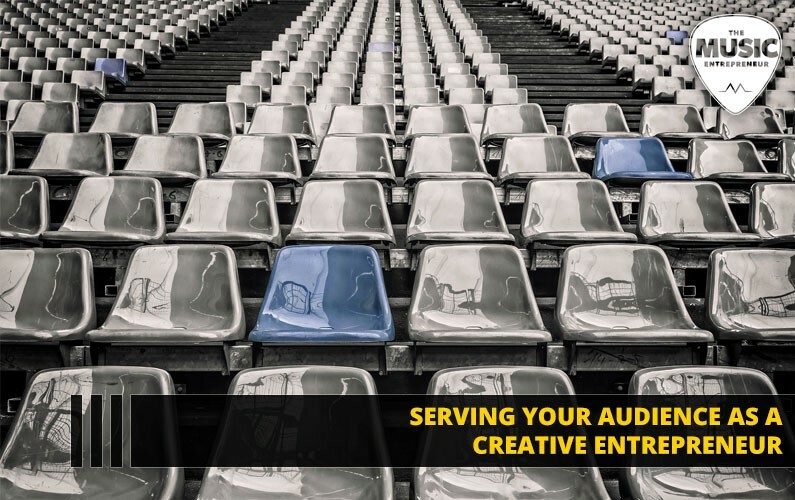 Let’s talk about serving your audience as a creative entrepreneur. Musician Jonathan Coulton was once a computer geek with a day job. Eventually, he was able to make the leap to stay-at-home dad and full-time musician. He’d been planning to leave his job for many years to pursue music. But before long, he found himself in his mid-30s with a mortgage, a wife and a daughter. With his wife’s blessing, however, he began writing and releasing one song per week. His songs were full of novelty, with plenty of references that would make a geek smile. And, they caught on fast. Soon, he found himself answering upwards of 100 fan emails per day. It was taking him four to five hours daily just to process all the messages. Sound like a good problem to have? I agree. But Coulton was quick to mention that having to answer that volume of emails was a lot like working a day job. It wasn’t long before he hired an assistant to help. Regardless, the point should be clear — Coulton felt it important that each of fans got a personal reply. Do you know anyone that’s shown the same level of dedication to their inbox? It’s not about what you think you would do in a situation like that. It’s about what you do when success suddenly descends on you. Someone who’s gone through the momentum of it will confirm that these are two different things. There are many ways to add value to your audience. In the world of online marketing, marketers often employ a strategy called content marketing. Essentially, it’s the act of creating content that serves and helps your target audience on an ongoing basis, ultimately ushering them onto taking a profitable action. You need not look far to see examples of this strategy in action. For instance, have a look at SuperFastBusiness. A quick look at the blog and podcast section of the site will show content on a variety of topics online business owners would find valuable — running a membership site, how to improve your marketing funnel, engaging your community and more. I do the same thing with The Music Entrepreneur HQ. I publish content on a variety of topics musicians and music entrepreneurs would find valuable, whether it’s booking shows, designing a band logo, steps to become a professional guitar player or otherwise. The content is free, but it serves a purpose. And that purpose is to generate traffic to the website, build trust and get visitors to subscribe to my email list or purchase a product. Content is a powerful traffic generation tool. No matter how you go about it, giving something away for free is a great way to build your audience. You don’t necessarily need to give it all away. But it is a good idea to think about what you can do on an ongoing basis to connect with your visitors, prospects and customers. It’s all good and well to add value to your audience. But this won’t do you much good if you don’t know what they want to begin with. Today, people vote with their attention. An often-quoted marketing stat shows that the average person’s attention span is about eight seconds, which is less than a goldfish. I don’t buy into that statistic, even for a moment. But it is true that if you have someone’s attention, they’re far more likely to do business with you. People buy from those they know, like and trust. That’s something that hasn’t changed in a long time and it isn’t about to change either. When you are truly serving your audience, you aren’t just creating content or a product. You’re creating something they’ve specifically asked for and want. So, you need to pay attention to your audience. Read their blog or social media comments and their emails. Survey them. Check your analytics (i.e. with Google Analytics and Facebook Insights). There’s a good chance you will build a more profitable business if you pay attention to your audience’s interests and needs. When you think of “sales”, what words immediately come to mind? Pushy? Aggressive? Manipulative? Intrusive? Slimy? I know, sometimes sales can sound like a dirty word. And most of us have that experience of being pushed into buying something we never intended to buy to begin with. But if you’re a creative entrepreneur, then the importance of sales should be obvious. Without sales, you wouldn’t have revenue. That’s a problem. In business, I would suggest under-promising and over-delivering, and that flies in the face of traditional sales, which was often manipulative. Traditional salesmen often focused on getting the sale instead of adding value to their prospect. They over-promised and under-delivered, because by the time the customer had made a buying decision, the salesperson had built up her product to be the best thing since sliced bread. That’s the opposite of what you should do as a creative entrepreneur. We want to under-promise and over-deliver. That extends into anything you’re selling. We should go the extra mile to delight and surprise our prospects and customers. That will keep them coming back for more. There is a limit to what you can do as a solopreneur. So, building your team and having skilled people work in the right departments can help you manage the work involved in creating a standout customer experience. But you know as well as I do that big companies don’t always have the best customer service, right? How many calls have you made to utility or communications companies that force you to menu surf for five to 10 minutes (i.e. “press one if you want to hear your current balance…”) before you could get a real person on the other end to help you solve your problem? Whatever you do early on to surprise and delight your customers may not be sutaintable or scalable over the long haul. In other words, you may not be able to do it forever. But it’s still worth it to put your best foot forward. And, when you’re ready to bring on your team, you should systematize the customer experience so that you can offer the same quality experience every single time. Originally published at www.musicentrepreneurhq.com on December 24, 2018.